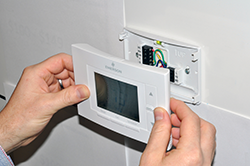 In cooperation with the U.S. Consumer Product Safety Commission, White-Rodgers is undertaking a corrective action plan that affects certain first-generation Emerson branded Sensi thermostats. This corrective action involves Emerson-branded Sensi thermostats that have date codes from 1416 to 1536. 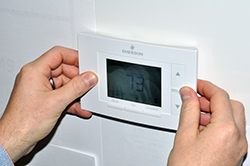 Affected thermostats can be damaged by household line voltage during service or replacement of a heating or cooling system, posing a fire hazard. If you suspect that your thermostat is included in this recall, continue reading below to learn about how to implement this corrective action. To view the US CPSC Press Release, Health Canada's Press Release, or our FAQs please click on the menu button at the top of this page. How Do I Know If My Thermostat Is Part Of This Recall? If you own the product pictured below, your thermostat may be included in this recall. The first step to quickly determine if your thermostat is potentially included in this recall, is to look at the front of your thermostat. 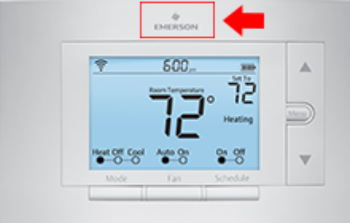 If the brand name printed on the front of your thermostat reads EMERSON, then please continue reading below to provide more information about your unit. 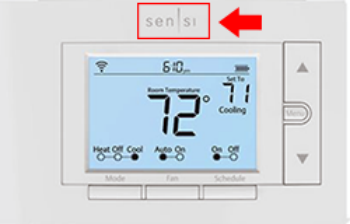 IMPORTANT: Please note if the brand name printed on the front of your thermostat reads SENSI, your unit is not included in this recall and you do not need to register. Please click the button below the photograph that shows the brand name that is printed on your unit. You selected that the brand name Sensi is on the faceplate of your unit, therefore your unit is NOT AFFECTED by this recall. 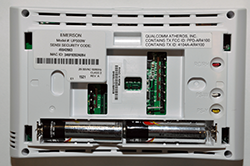 Only units with the brand name Emerson on the faceplate are included in this recall. Please review your selection and confirm it matches what you see on the face of your thermostat. If your unit does not have Emerson printed on the front, then your unit is not affected by this recall and no further action is required. Remove your unit from the base plate like you would to change the batteries. Grab the thermostat body with one hand on each side and gently pull it off of the base plate that is attached to the wall. 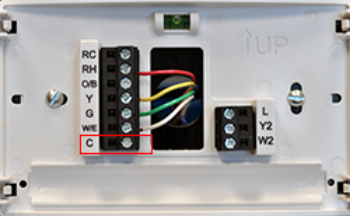 Thermostats included in this recall are powered by a wire connected to the "C" terminal on the base plate. 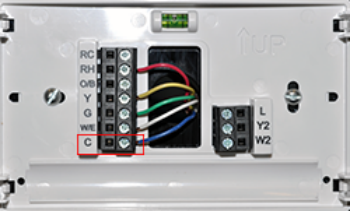 With the thermostat removed, check if there is a wire connected to the terminal marked “C” on the base plate. If there is no wire then you do not need to register and no further action is required. Please click the button below the photograph that shows how your C Terminal looks. You selected that you do not have a wire connected to the C terminal therefore, your unit is NOT AFFECTED by this recall. Only units with a wire hooked up to the C terminal are included in this recall. Please review your selection and if it is correct, your unit is not affected and no further action is required. 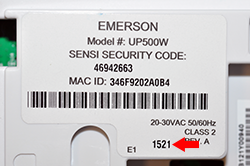 Thermostats included in this recall have a date codes from 1416 to 1536. 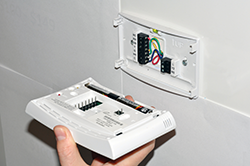 Turn the thermostat over, check the product label for the date code and MAC ID and enter in the boxes below. We have entered the first 6 digits of your MAC ID for you, please enter the last 6 digits of your MAC ID. Only units with date code in the range of 1416 - 1536 are are included in this recall. Your unit is not affected and no further action is required. We will enter the part of your MACID that begins 346F92 for you. You only need to enter the last 6 digits. So if your MACID is 346F9201P45C you will enter 01P45C. Please confirm you have the correct values in both the Date Code field and the MAC ID field. If your entries match what you see on your unit and you continue to get this message, your unit is not affected by this recall. If you have any questions please call the number at the bottom of this page. The MAC ID you entered is not valid. MAD IDs should be 12 characters long. This MAC ID has already been registered. If you feel like you are receiving this message in error please call the number at the bottom of this page. The combination of date code and MAC ID you entered is not affected. 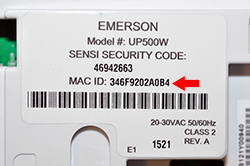 Even though the date code is in the range, we used your MAC ID to verify your thermostat is not affected. If you need assistance, please contact a representative at 1-888-847-8742 between 7 a.m. and 6 p.m. (Central Time) Monday through Friday. © 2019 - ©2017-18 Emerson Electric Co. All rights reserved.